KUALA LUMPUR: The first bicycle path in the city, stretching 5.5 kilometres from Dataran Merdeka to the Mid Valley City in Bangsar, is now open to public. The facility was launched by Kuala Lumpur Mayor Datuk Seri Ahmad Phesal Talib this morning when he and other cyclists utilised the bike path from Mid Valley City for the first time. 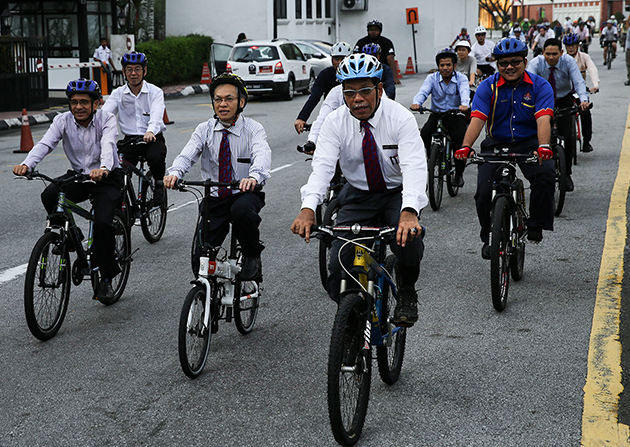 “I hope the bike path will be put to good use and not be misused in any way,” he told newsmen at a Press conference at Kuala Lumpur City Hall after the launch. The construction of the bicycle lane – which passes through Sungai Klang, Brickfields, the compound of Kompleks Dayabumi and then to Lebuh Pasar Besar – was kick-started in 2013 and cost about RM700,000 to build. The bike path is to provide the public with an alternative way of travel within the city in a bid to lessen the number of vehicles on the road which contributes to daily traffic congestion. It is also aimed to lessen pollution in the Malaysian capital. Besides that, it could also help to instill a culture of cycling amongst Malaysians, especially those residing in the city, which is in line with the aim and implementation of Fit Malaysia in shaping a healthier nation. Cyclists using the bike path for the first time today. The facility hopes to lessen the number of cars on KL roads. Meanwhile, Ahmad Phesal said another two bicycle path projects would follow – a four-kilometre lane from Wangsa Maju to Taman Melati, and another from Wangsa Maju to Taman Batu Muda which stretches two kilometres. The estimated construction cost for these two projects involved some RM2.3 million. “We are also mulling on another similar project at the area along Sungai Bunus. If the project can be expanded to be part of the ‘Greater KL’ plan, why not?” he said. 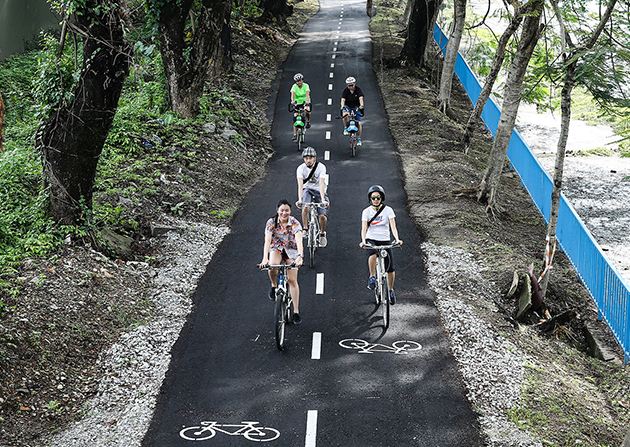 The bike path project is part of Kuala Lumpur's tourism plan to showcase the Malaysian capital as a developing city that promotes healthy living. 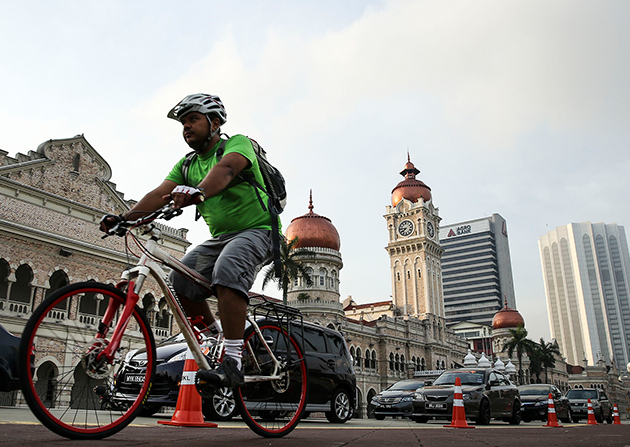 The bike path projects were part of the Malaysian capital’s tourism plan to showcase Kuala Lumpur as a developing city that promotes healthy living. However, much can still be done to improve the Mid Valley City-Dataran Merdeka bicycle lane, said Ahmad Phesal. This includes the use of solar lights and the installation of close-circuit televisions (CCTVs) for safety purposes, and to beautify the landscape along the path which will be done from time to time. City Hall officers will also be on duty to patrol the bike lanes to maintain the traffic and safety of cyclists using them. “We will beef up the number of patrol officers. Right now, City Hall has a bicycle patrol unit comprising 20 people and 40 bicycles, and this will be increased in due time,” Ahmad Phesal added.